This coming Monday, Memorial Day, marks the 100th anniversary of the birth of our 35th President, John Fitzgerald Kennedy. Like almost every American over the age of 60, I can tell you precisely where I was on Friday afternoon, November 22, 1963, when I heard the news that President Kennedy had been assassinated. I was sitting in Mrs. Choate’s 6th grade class at Frayser Elementary School. My classmates and I had just come back from lunch, and we were anxiously awaiting the 3:00 p.m. bell which would signal the start of the weekend. Another teacher knocked on the door of the classroom and said to Mrs. Choate, “I need to talk with you.” Mrs. Choate then left the room for several minutes. In her absence, my classmates and I did not turn our attention to school work. We just laughed and carried on in anxious anticipation of the upcoming weekend. Mrs. Choate then abruptly left the classroom, and my entire class sat in stunned silence. Some of the kids started to cry. I did not, because I was absolutely convinced that what Mrs. Choate had told us had not happened. I was confident it was just some terrible rumor and there was no basis to it. I just couldn’t imagine something like that could have happened in our country. On Friday afternoons at the end of the school day, my classmates and I generally ran out of Frayser Elementary School yelling and laughing and heading for a weekend of riding our bikes, playing football or basketball, or watching cartoons on Saturday morning television. But on Friday afternoon, November 22, 1963, we just all walked home quietly, not even speaking to each other. During my short walk home, I reassured myself that the news Mrs. Choate had given us was not true. I still believed it was some awful baseless rumor. But as I walked toward my house, I noticed my father’s car in the driveway. Dad was never at home in the middle of the afternoon. He would always arrive from work shortly before dinnertime. When I saw his car, I knew the news was true. President Kennedy was dead. When I walked in my home, my mother and father were sitting in the living room watching Walter Cronkite on TV. For the next three days, my mother and father and I sat by the television. On Friday evening we watched as Air Force One brought the body of President Kennedy back to Washington from Dallas. We saw First Lady Jacqueline Kennedy and Attorney General Robert Kennedy exit the plane beside the President’s casket. We saw our new President, Lyndon Baines Johnson, make a brief statement asking for our prayers for the Kennedy family and also for himself as tragic events had made him the 36th president. There were no cartoons on TV for me to watch on Saturday morning. I did not go out and play on Saturday afternoon. I just sat by the television set with my parents and watched as President Kennedy’s body lay in State first in the East Room of the White House, and then in the Capitol. On Sunday morning, my mother and father and I left the house to go to church. When we returned from church, we heard the news that the suspected assassin of President Kennedy, Lee Harvey Oswald, had himself been shot and killed in Dallas as he was being transferred from the Dallas City Jail to the Dallas County Jail. My mother and father and I did not rejoice when we heard the news. It just compounded our shock. In contrast to our world in 2017, the world that Mom and Dad and I knew in 1963 did not involve shootings. There was no school on Monday. Again, Mom and Dad and I sat by the television. We watched the funeral procession from the Capitol to the White House, and then to St. Matthew’s Cathedral, and finally to Arlington National Cemetery where the President was buried. On Tuesday morning I returned to my 6th grade class at Frayser Elementary School. But I’ve never gotten over the events of November 22, 1963 and the long sad weekend that followed. I was only 12 years old that fateful Friday, but a lot of my childhood innocence was lost that day. 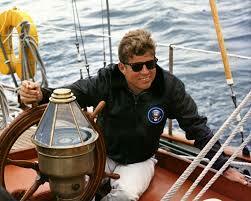 This coming Monday, I will remember that young President, John F. Kennedy, who reminded me so much of my own father. I will remember his inspirational speeches, his energy, and how he made us all excited about our country and its future. Nick McCall: Very poignantly recollected and written, Billy. Thanks. A thoughtful Memorial Day weekend to all.